Packaging is a hot topic at the farm and something that we are extremely aware of. We do not use excess packaging and any packaging we do use is carefully considered. 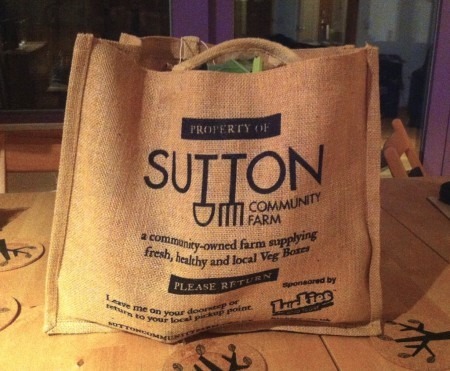 We are the first London VegBox scheme to use returnable jute bags. Simply hand over the old bag to your pick-up point at the same time you pick up your new bag, or alternatively bring your own bag with you and transfer your items into that at the pick-up point, leaving the farm bag behind for collection. If you have a home delivery, just leave the old bag on your doorstep. We know that customers will sometimes forget. We can cope for a few weeks, however, if you keep forgetting to return your bags, we will quickly run out. If this keeps happening, we might have to revert back to plastic. This is something we really want to avoid so please return your bags! Although plastic bags are convenient, we’ve been uncomfortable with them, as are many customers. Every year, millions of tonnes of plastic end up in our oceans or get incinerated, releasing pollution. We don’t want to be part of that story. Our farm is about demonstrating a brighter future where we are smart with our resources. Jute is a natural fibre which comes from plants. It’s biodegradable, which means it decomposes rapidly, after it’s had plenty of use, of course! We use these to bundle portions together or to keep the lids on punnets. Feel free to return them for reuse – we know how they have a habit of building up at home! When we have to package individual items we often do so in recycled brown paper bags. They can be put in with your regular paper recycling or compost. For delicate items, we sometimes use paper pulp punnets which, again, can be recycled with your paper or composted. Feel free to return the paper punnets for reuse. For salads and greens we use small biodegradable plastic bags, as paper bags absorb water and break. Whilst these bags are biodegradable, they are not suitable for your home compost. Please either reuse them or discard them in the your regular rubbish where they will eventually break down in landfill. The science of plastic packaging is challenging and we’re trying our best to make the most environmentally conscious choices. It’s tricky, so please contact us if you have any expert advice!